Excellent service, valued seller, a pleasure to do business with***.Thank you!!! Item as described and was received sooner than expected! Great Seller! Very fast responding seller, great doing business with. a+ seller, fast, no problems. Finally a company developed a home security camera that works well. 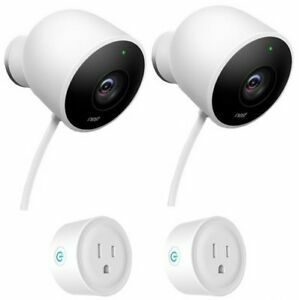 Several years ago I purchased 5 Netgear Arlo cameras. The batteries were always dead and the cost to keep them going got to be way too much. 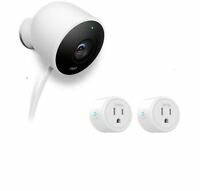 I switched to Nest cameras and now have 7 of them in and around my home. They work flawlessly and NEVER need batteries. I was concerned at first about finding power sources but with some thought that actually turned out easy and now I don't worry about dead batteries anymore or a server that is down. You can see the quality the minute you open the box. NEST IS BEST! The Nest outdoor cameras have been my best eBay purchase to date. I hired a tech contractor to install them, but we just LOVE them! Nest aware is good but the camera itself should have a real time zoom. Not just a snapshot of incident zoom. 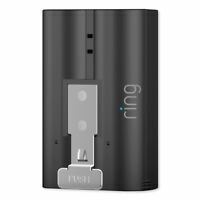 Great product highly recommend !